Welcome to Upper Chesapeake Yacht Sales. In our first ten years of business, we have established ourselves as one of the finest sales and yacht brokerages on the Chesapeake Bay! 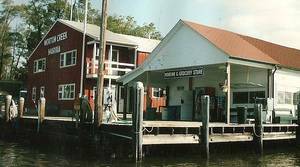 We are located on the Eastern Shore of Maryland at Worton Creek Marina and serve the needs of customers throughout the Mid-Atlantic region and beyond. With a combined experience in excess of 90 years in boating, our knowledge and passion for boating can assist you in making the right decision in selling or purchasing the boat of your dreams. Convenient onsite dockage for brokerage boats, financial services, insurance and documentation services are available to make selling or purchasing a boat or yacht through UCYS an easy and enjoyable experience for the first time or seasoned boater. This Bertram 31 is an original 1966 hull, but she had a 2004 total rebuild. Workmanship and attention to detail on this vessel are flawless and equipment the best that money could buy. The refit was done by John Patnovic of Worton Creek Marina who has specialized in the remanufacture of Bertram 31's. Once in a life time opportunity to acquire a custom Bertram with 440hp Yanmars, gen set, full tower at a fraction of cost to replace. Vessel has been maintained with an open check book and shows as new! Estate sale looking for offers.